Run virtual instruments and effects using the innovative, dedicated performance muscle of the Muse Research RECEPTOR. The world’s greatest keyboardists, guitarists, drummers, producers, engineers, film and TV composers, and music theater companies rely on RECEPTOR as their #1 solution for running virtual instruments and effects with unrivalled, road-worthy stability, speed and performance. The RECEPTOR was designed to do just one thing: make music. Its purpose-built, mission critical custom system software and audio hardware is housed in a beer-bottle proof metal case. It’s the best possible solution for taking your virtual instruments and effects out of the studio and onto the stage. The RECEPTOR’s highly optimized, super-efficient and super-stable OS runs on state-of-the-art, customized intelligently design hardware with an easy-to-use, on-board control panel and a smartly configured graphic user interface. 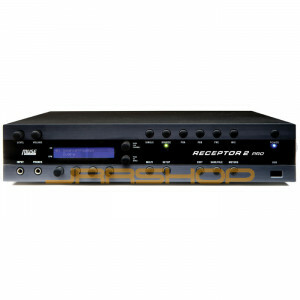 RECEPTOR is perfect for live performance. It frees you from complex and messy setups, untimely crashes and over-heating, or the worry that your entire world will be destroyed if it gets dropped. And in the studio RECEPTOR will work hand-in-hand with your DAW, allowing you to run those massive plug-in libraries without clogging up your processor. RECEPTOR comes in three highly optimized models that run faster and more efficient than anything you’ve ever tried before. Now you run more virtual instruments and effects with more polyphony and lower latency than comparable systems. When you combine super-fast hardware with highly optimized software, the result is a solution that is more efficient, more stable, and simply better than anything else available. And you’ll be making music right out of the box since you get over 400 instruments with the included MusePlayer software – a $500 value – as well as IK Multimedia’s Amplitube DUO, a $99 value – for FREE, along with dozens of other virtual instruments and effects with hundreds of presets that will get you on you music-making way. RECEPTOR is also great for the environment, with a new EnergyStar™ certified power supply. And weighing in at a svelte 18 pound shipping weight, it easily reduces your carbon footprint on tour when compared with the gear that would be required to do what the RECEPTOR can do in just two rack spaces. RECEPTOR is also easy on the eyes, with a gorgeous blue-backlit LCD display, beautiful milled aluminum knobs, and a cool, black anodized aluminum front panel. It wouldn’t be a RECEPTOR without our legendary sound quality, and RECEPTOR packs that in spades. You’ll find balanced line-level inputs and outputs, S/PDIF digital input and output, high performance front panel instrument input, and an 8-channel ADAT optical output. Whether you run at 44.1kHz, 48kHz, 88kHz, or 96kHz, RECEPTOR gives you inspirational sonic performance with minimal latency… It’s as if your virtual instruments and effects suddenly became real! RECEPTOR is a ‘ready to rack’ instrument for players who demand unshakeable stability and super-tight performance, whether you play live or in the studio. If you want to run large numbers of virtual instruments and effects with minimal latency and maximum polyphony, then you need RECEPTOR. Quite simply, RECEPTOR is the smarter, faster, better way to make music…your music.